I think Ronsil had the knife , ask his advice. Just a comment. I think you will enjoy the Vesuvius but be warned there is quite a lot to learn. The steam blade I found great but why not start off with the 'status quo' then after a few months you will see for yourself what is needed for your own development. The blade is a very expensive tool & if you are only producing a few milk drinks it may well prove to be an un-neccesary expense. The biggest plus you will see is from temperature stability and hopefully just making your coffee experience easier and more consistent. Stick to a simple profile, short pre infusion and 9 bar and get a tasty coffee first. Leave the steam arm, a knife is massively over priced. First of all get a standard heavy duty 13 amp UK plug. The power lead is an EU one and you will have to cut off that and wire the UK one - 5 mins. I did get the KVW shower screen - not sure if its any improvement though. Profile wise I have a std 9 bar, a 9 bar with preinfusion, a 6 bar plus two lever style ones. 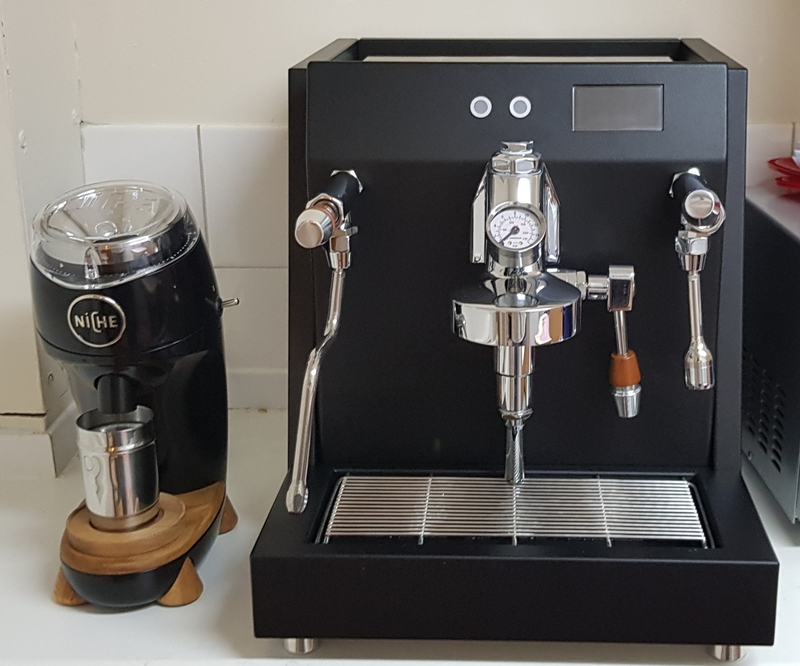 To use the same grind on my L1 I use the lever profile but with PI 7sec at 2 bar instead . Can produce some excellent shots and as said before is very temp stable. The boiler offset is set at 13c which is spot on when I did a home made space test. Just make sure that all the defaults are set to DaveC’s excellent guide. I'd suggest setting the temperature to 93 degrees then leaving it. I tend to flip between a 6 bar flat profile and a similar profile to Steve; 14s at 2 bar then 9 bar declining to 6. I'm generally using a ratio of 18 to 38 to 45. I use lighter roasts through an EK43. I tried the Niche but think ibprefer the EK from a flavour perspective. I need to get them side by side again before I conclude that comparison though. I have the blade. I quite like it but I'm not sure it's any better than the 4 hole tip I use at work. Perhaps easier with small amounts of milk. Unpacked and put on counter. Now to go through the manual. Will post pic of the setup once I've found a way to upload. It's gorgeous!! Last edited by sanadsaad; 06-11-18 at 11:07.